Caldeira das Sete Cidades, an important source of fresh water for the islands, provides a subtropical oasis of green hills, dense forests, and foggy bluffs. Formed by a prehistoric volcanic eruption followed by another in 1445, the area is actually a large volcanic crater. The resulting land offers an array of flora and fauna. Take one of the trails that will lead you up to the top of the crater, where you'll observe numerous lakes, the ocean, and the quaint town within. 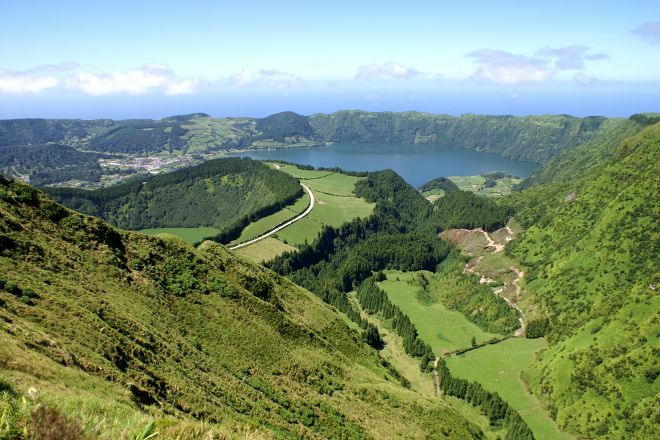 Work out when and for how long to visit Caldeira das Sete Cidades and other Sao Miguel attractions using our handy Sao Miguel trip planner . Beautiful, but after all lots of things seen on Sao Miguel and the publicity to read about this is I find it disappointing. Was beautiful, but have nicer things seen. Etwas für Naturliebhaber, kein Massentourismus. Wunderschön und sehr gepflegt. Something for nature lovers, no mass tourism. Beautiful and well maintained. Espetacular este lugar. Vista maravilhosa da caldeira do vulcão. Região muito linda, imperdível. Spectacular this place. Wonderful view of the caldera of the volcano. Very beautiful region, not to be missed. Every day, we help thousands of travelers plan great vacations. Here are some tips on how to use your Listing Page to attract more travelers to your business - Caldeira das Sete Cidades. Promote your permanent link - https://www.inspirock.com/portugal/sao-miguel/caldeira-das-sete-cidades-a620810283 - on your website, your blog, and social media. When a traveler builds a plan from this page, the itinerary automatically includes Caldeira das Sete Cidades. This is a great way for travelers looking for a great vacation in your city or country to also experience Caldeira das Sete Cidades. Promoting your link also lets your audience know that you are featured on a rapidly growing travel site. In addition, the more this page is used, the more we will promote Caldeira das Sete Cidades to other Inspirock users. For best results, use the customized Trip Planning Widget for Caldeira das Sete Cidades on your website. It has all the advantages mentioned above, plus users to your site can conveniently access it directly on your site. Visitors to your site will appreciate you offering them help with planning their vacation. Setting this up takes just a few minutes - Click here for instructions.